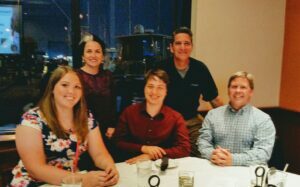 This week, a few from NOVA’s Panama City Beach team attended the Florida Engineering Society and Society of American Military Engineers 2017 Engineering Week Banquet. Thanks to guest speaker Keith Bryant, Bay County Public Works Director for a great program on the Bay County ½ Cent Sales Tax Projects. Bring on the work! (left to right) Bailey Webster, NOVA Panama City; Jennifer Wolgamott, ZHA; Jordin Findling, NOVA Panama City; Mario Gisbert, Panama City Beach City Manager; and Chris Conway, NOVA Panama City.